Munchkin is just having all sorts of news around it lately. There's the guest artist editions. There's various expansions coming out. There's also the new The Nightmare Before Christmas set that you can now pre-order. Aside question: Is that movie a Halloween movie or a Christmas movie to you? 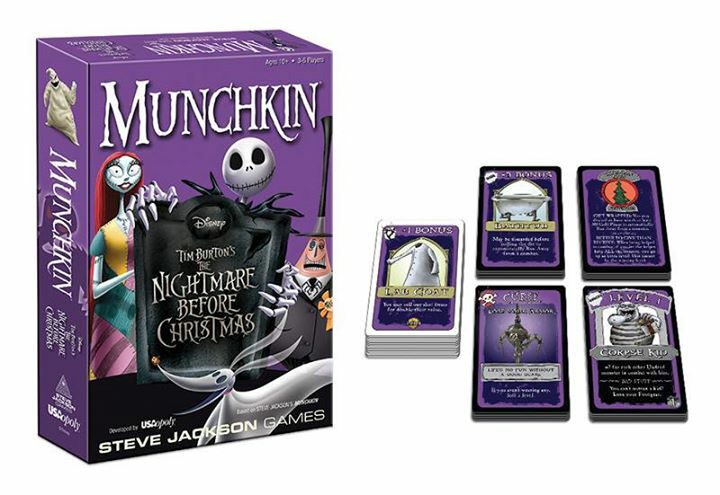 USAopoly and Steve Jackson Games are teaming up in order to bring you this new set. Grab weapons like Vampire Teddy, Mayor's Badge, and the Bat Hat. You can be a citizen of the various holiday towns (be it Christmas, Halloween, Easter, or Thanksgiving. Attack monsters like Doctor Finkelstein, Oogie Boogie, and Lock, Shock, & Barrel. What's this? It's a new melding of a favorite game and a favorite movie, that's what.